Boat carpet needs to be marine graded and withstand harsh damp environments without breaking apart. Luckily, installing boat carpets is fairly straight forward and easily installed with pre-glued backing that simply sticks straight on. The best boat carpet is the Do It Yourself Carpet by Marine Carpeting that is dense high quality carpet at 32 oz and available in 5 different sizes and 3 different colors. The quality of the carpet is easy to tell by the weight as it will identify the number of fibers it has. The heavier carpet, the more dense the carpet will be and it will be a better overall carpet for your boat. Marine boat carpet can become easily damaged through water, UV rays and other environmental defects. Carpet that is textured will assist with the stain resistance and fading with a protective layer and also add to the non-slip surface. Unlike the household carpet, there is no issues with the skirting board or other obstructions. Boat carpet is much simpler to fit with pre-glued rubber backings or alternatives that snap into place. Boat carpet replacement is fairly common as no matter how protective the carpet is, it will always break down as it ages. Below is a list of the best boat carpet that has excellent marine graded qualities and different styles. The Marine Carpeting offer a range of carpet at different weights but the 32 oz is the highest quality. It will simply glue straight to the deck of your boat and it is straight forward as that to replace your old carpet. This carpet comes as a package with the carpet, instructions, knife and extra blades for simple fitting. Avoid the cheap and nasty alternatives that you can find at local stores because it will serious ruin the look and feel of your boat. 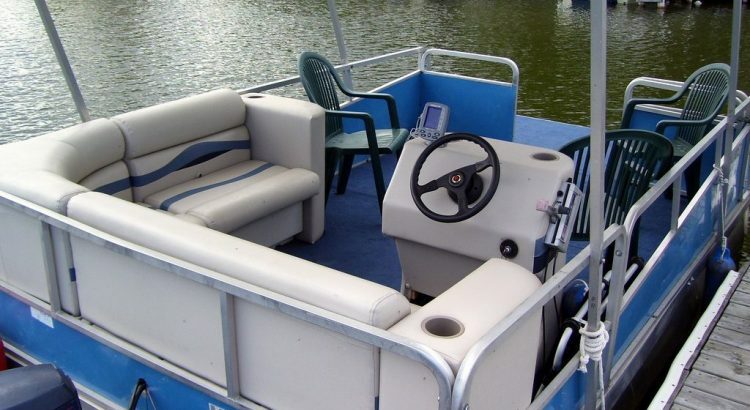 Overall, it is the best boat carpet replacement for pontoon boats that require a complete overhaul. The 32 oz dense carpet has many fibers that will be comfortable on the feet when barefoot. The BCS marine graded carpet for boats is a 100% UV stabilized Polypropylene construction that is designed for outdoor usage and is completely stain resistant. It is 16 oz in weight and is suited for those on a budget. It is available in 6 different sizes and 12 colors for the savvy boat owner to have their styling expectations met. It is a popular carpet of choice for many boat builders as it folds easily for installation and it also acts as a fire retardant. The BCS Cutpile Marine Carpet is the best cheap boat carpet that is high quality and has an excellent choice of colors. It is only available with a 16 oz weighting but the low cost of the carpet does outweigh this single drawback. For owners of Pontoon boats that want the best, this premium boat carpet provides a rubber backed, non-flammable, easily pliable, easy clean and simple fitting carpet. It is backed with a 3 year warranty for peace of mind and is available in 10 different colors and 4 sizes. It can be used for pontoon boat carpet, bass boat carpet, bayliner boat carpet, deck boat carpet and even household situations. It is a 20 oz marine grade carpet for those wanting an expensive look and feel. As the sizing availability suggests, the carpet is made for pontoon boats rather than smaller vessels. Starting from 8.5′ to 16 to 8.5′ x 30, it make installing in big areas much easier and is the best boat carpet for large boats such as pontoons and others. The Value Carpets alternative is only available in one size and is a 16 oz pile weight. However, it does come with an excellent selection of carpet colors that comes with a two year sun fade warranty for peace of mind. As the brand name suggests, the carpet is reasonably priced and includes a marine rubber backing and the pile is completely UV stabilized. Overall, it is a great all rounder with a good selection of colors that may satisfy the needs of a boat owner. The lack of sizes may be an issue with installation as there may be more off-cuts. The Lancer Marine Carpet is another good alternative with 11 different colors in a single pre-cut size that can be used for marine carpet replacement. The rubber backing is flexible yet strong and will easily fit in a range of locations. The pile is long lasting with UV stabilized pile and is stain resistant, which is great for boating. The pre-cut size is 6 X 20 and is 20oz in weight, which is a standard replacement size for carpets. Overall, it is an expensive alternative but it is a high quality dense carpet that is great for replacements and full carpeting on any boat. Adding carpet to your boat can improve the looks, increase the resale value and increase the comfort on-board. Carpet is added to a range of boats no matter the size but Pontoon boats are usually fitted with carpet when built. Before fitting carpet, its advisable to fit all deck mounted objects such as heavy duty boat ladders or even upgraded comfortable boat seats. This is because cutting holes into carpets after it has been laid has the potential to ruin your hard work. Household carpet purchasing takes a lot of planning and discussion and so should your boats carpet. Below are some factors that you should consider before purchasing. Boat carpet glue also known as adhesive is critical for the correct fitting. It doesn’t come with the package but it is a requirement if you plan on fitting new boat carpet. We strongly recommend buying top rated marine adhesive for your carpet. The best boat carpet glue is usually water based because it adhere better to the rubber backing that the majority of recommended boat carpets above use. Alcohol based glues will deteriorate over time and loose its strength. Before you attempt to glue to the carpet to the deck, ensure that it is completely stripped of any dirt and other defect that could cause issues. Ensure that you have measured the boat deck that you are carpeting before purchasing. The worst thing to happen during the fitting is to find that you do not have enough to complete the job. It is strongly recommended that you purchase slightly more than is required for the job. Picking the color that looks best for your boat can be the most difficult part. Get it wrong, it can be an expensive mistake that you will regret. Usually, if the boat has other colors stitched into the seats, on the boat bimini top, decals or other parts, matching that will be the perfect combination. Improving your boats current damaged carpet with one of the recommended boat carpet replacements above will make a big difference. Some boat owners will simply just want a refreshing new color or wanting to add value to their investment. Choosing a heavier and more dense carpet with more fibers is highly advisable. Anything below 16 oz would be a carpet to avoid unless you plan on having another carpet padding underneath.